I received my first pressure canner/cooker as a wedding gift from Gramma Helen almost 40 years ago. 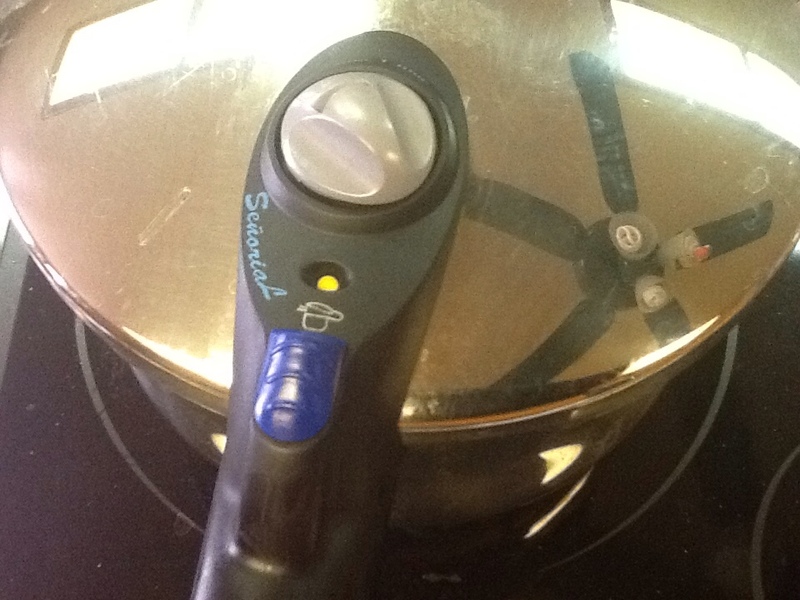 I used it to cook roasts and later for canning low acid foods like green beans. My first pressure cooker is aluminum, not the safest metal to cook food in, but still fine for canning. I blew the nickel safety plug once, during my first year of marriage. When the pressure cooker ran out of liquid, the plug hit the ceiling! I screwed in the extra plug that came with the pot, scrubbed out the burned on roast and my extra plug remains intact to this day! N.B.D. . . .NO BIG DEAL! Pressure canning back in my Gram's day was a very different story. My Momma bares a scar, she received as a girl, helping in the kitchen during canning time. Lids blew, glass flew and those horror stories are still are being circulated causing folk to be afraid of aaaaah!!!! the "PRESSURE CANNER"!!! These days, they are not any more dangerous than using a regular pot on the stove, and you can cook a chuck roast or pork roast in an hour! I'm talking about fall off the bone, fork tender, ready for shredding . . . MEAT! You can purchase a 18/10 stainless steel Fagor Splendid 6-quart Pressure Cooker for $59.99, U.S. This model only comes with (HIGH) and uses an internal cooking temp of 250 at 15 PSI. My Fagor has two settings LOW and HIGH but I only use high so the Splendid model will save you money. Before you begin read through all the recipe. 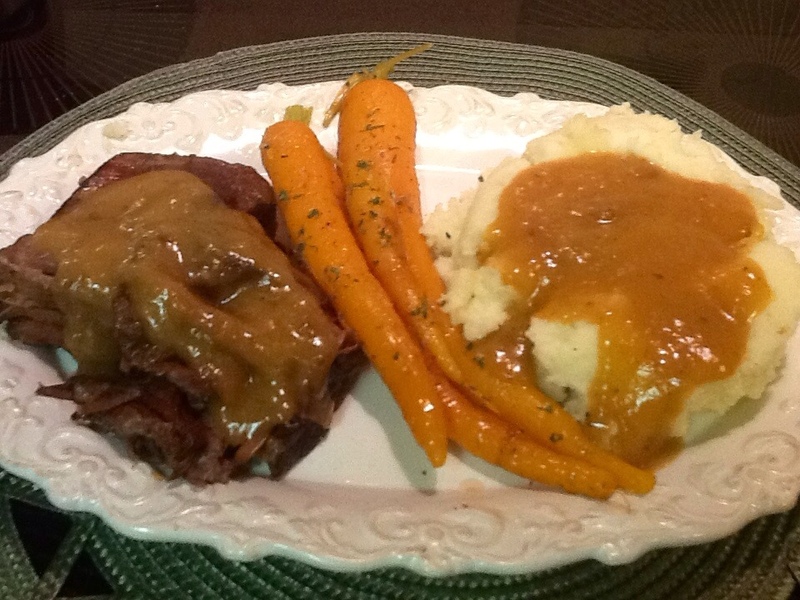 It's time to make fork tender "Chuck" with your pressure cooker! 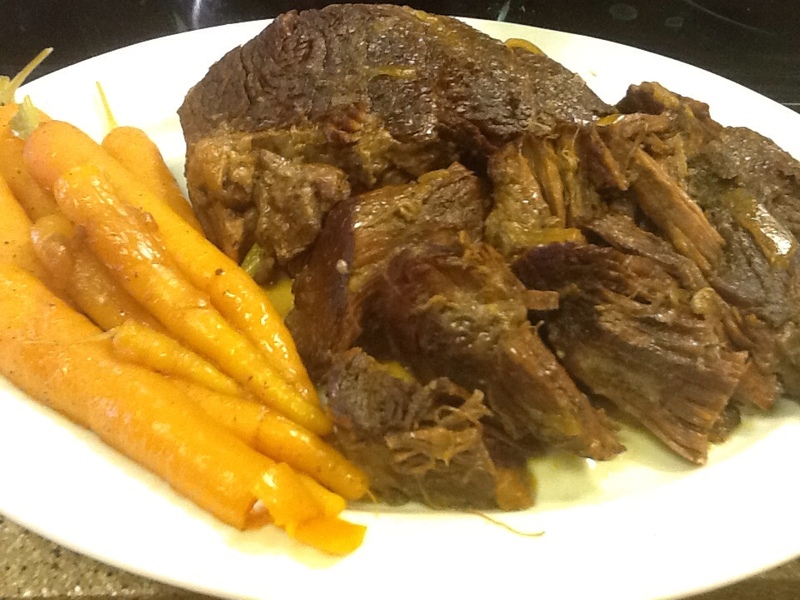 Start with a 3 to 4 pound chuck roast, season with salt and fresh ground pepper, both sides. Add 1-2 tablespoon olive oil to cooker, set heat on MEDIUM. Brown Chuck 5 minutes each side. When meat is turned add 1 sliced medium onion, brown with meat. 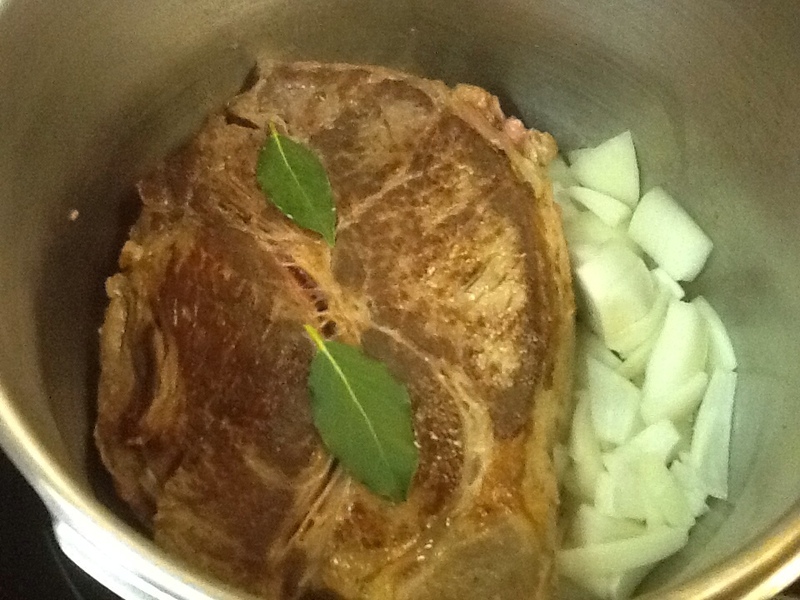 Add 1 1/2 cups of water and 2 bay leaves. Seal lid, and lock into place. Set pressure to 2 (HIGH). Set burner to HIGH, as pressure builds, the yellow pressure valve will rise to indicate that maximum pressure has been reached and steam will come out the exhaust. Once pressure has been reached, lower temperature to MED-LOW and set timer for 60 minutes. Note: To seal lid, line up the raised indentation (center of photo) on the lid with the handle on the pot. Turn handle clockwise to complete sealing lid. Slide blue button forward to lock. Set pressure gauge on 2 (HIGH). (I've turned the pot around so you can see the numbers). 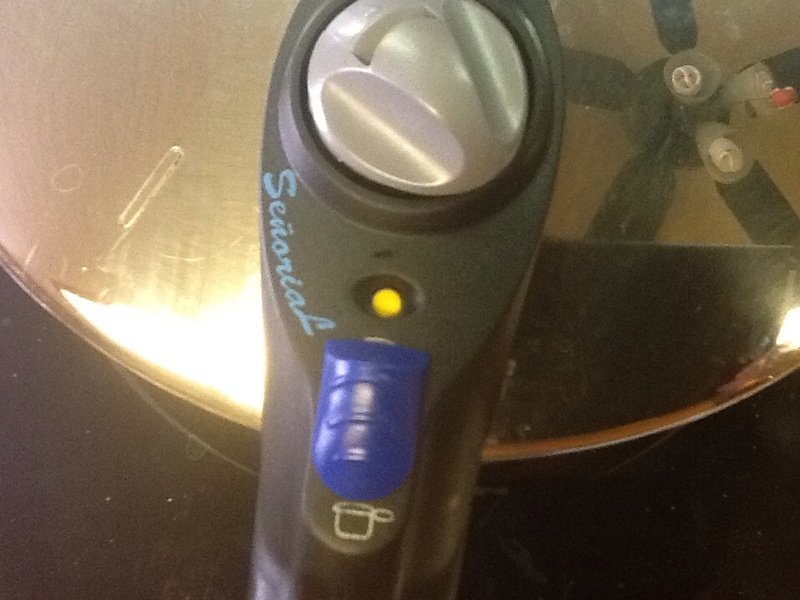 When timer goes off, turn pressure valve to the far left- QUICK EXHAUST, being careful to turn exhaust away from you so you aren't burned by the rush of steam. 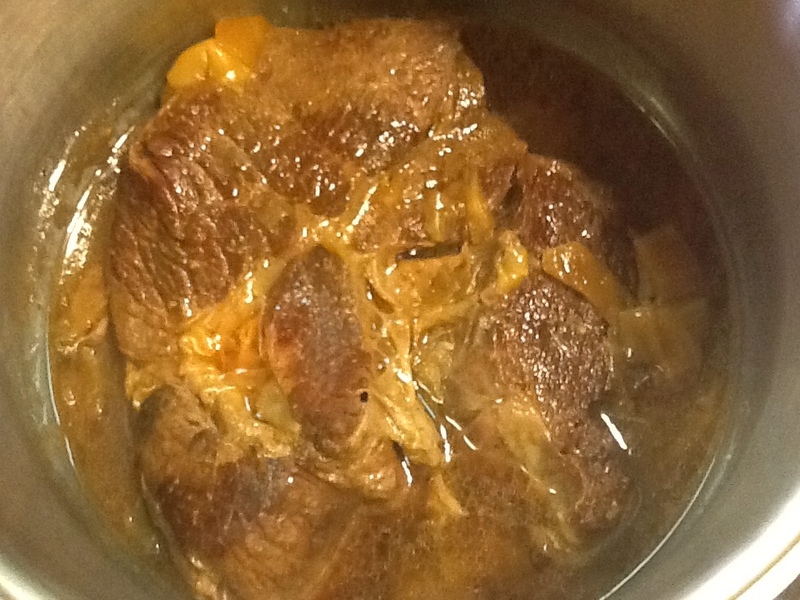 Cooked Chuck Roast. Notice the brown gravy juices. Add scrubbed vegetables, season them with salt and pepper. Reseal lid. Lock pressure button. Set pressure gauge on 2 (HIGH). Set burner to HIGH. When pressure is reached, turn burner to MED-LOW. When timer goes off turn valve to the far left- QUICK EXHAUST making sure it is turned away from you and others. 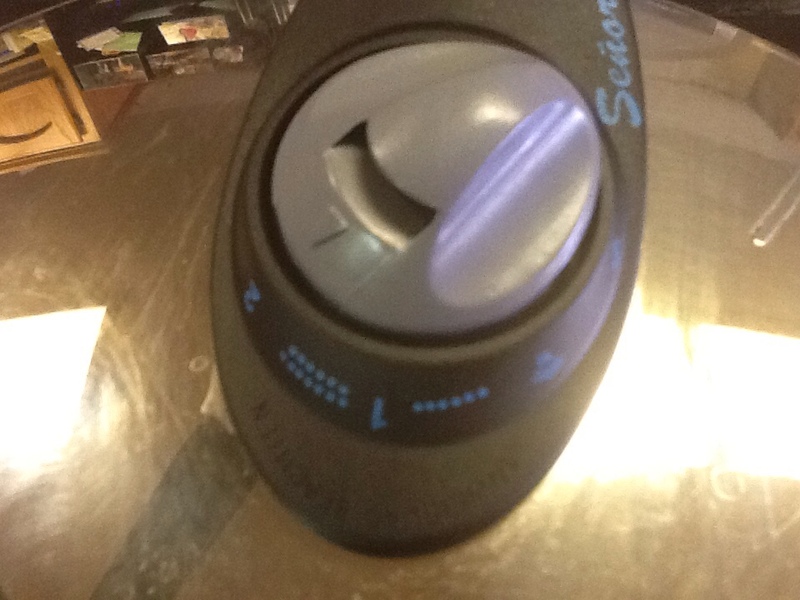 Slide blue button towards handle to unlock. Turn upper handle counter clockwise and remove lid. Carefully remove vegetables and place on platter, being careful not to break them. Remove meat and place on platter. Make gravy. Enjoy! 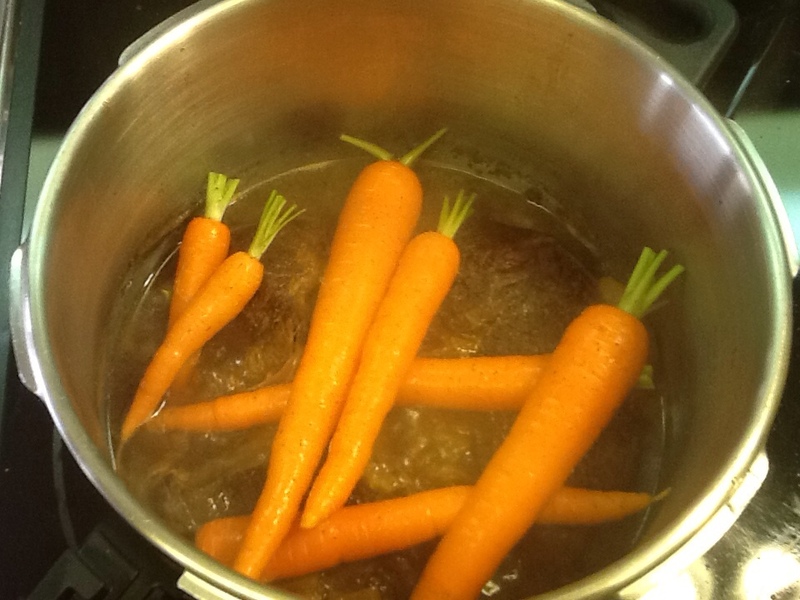 Rub a little parsley in the palm of your hands to sprinkle over the carrots. This looks good enough to eat . . . Over at Julie's!!! Looks great! But, I beg to differ on LOW. I'm always using LOW pressure for veggies, fish and eggs! 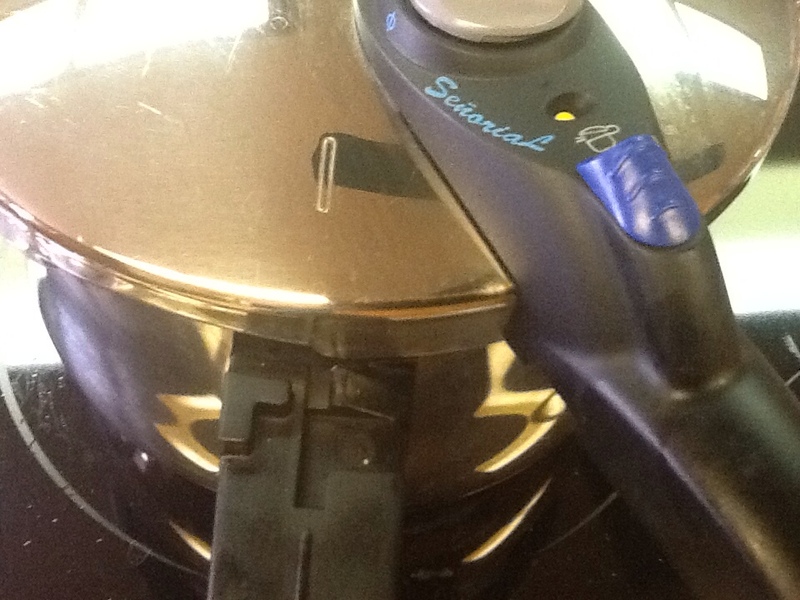 I am using my new Fago 8 qt Duo pressure cooker too. In their canning manual I couldn't find the time to cook the green beans in quarts, but there was a mixed veg recipe that said to time for 90 minutes, so I did for 1 can quart of green beans. You certainly did overcook your green beans but next time you'll know. . . The important thing when canning is to use a canning cookbook, like Blue Ball Canning Book. It really will explain the whys and hows for using a pressure cooker for canning low acid foods. One of my favorite ways to can green beans is to add a little lemon zest, it really adds a nice touch.